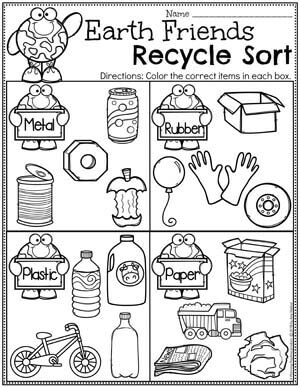 Are you looking for fun Earth Day Activities for a recycling or Earth Day theme? 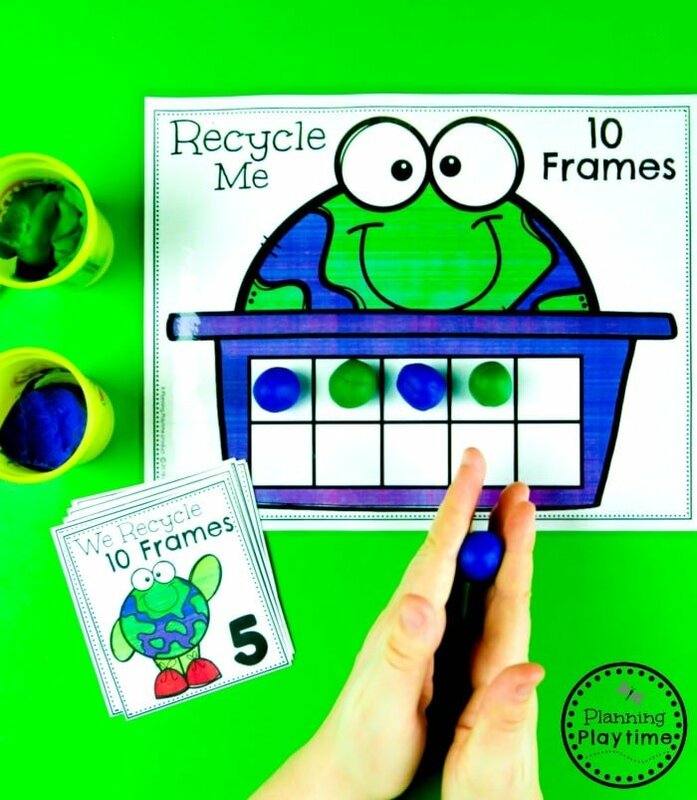 We LOVE these hands-on, play-based math, literacy and other Earth Day learning games for preschool. 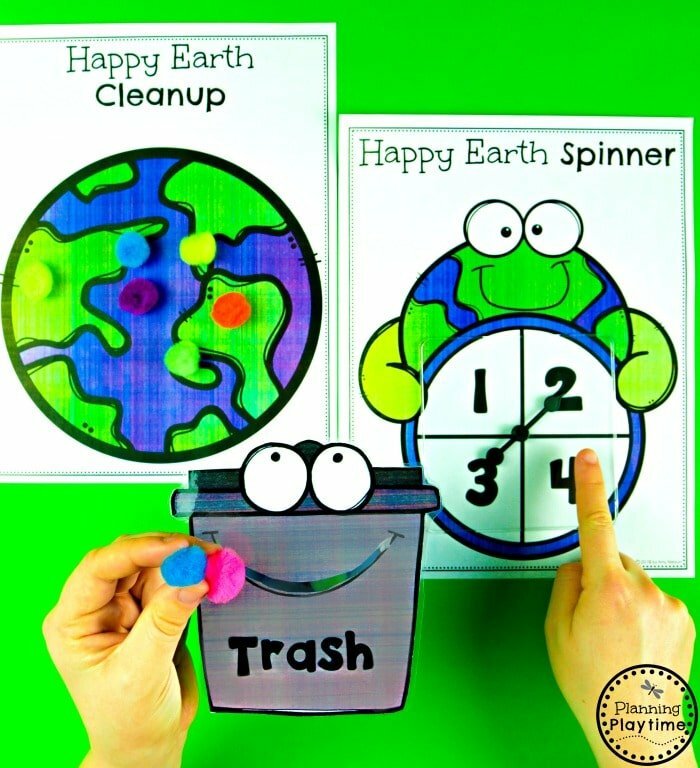 This set includes a fun Earth Day Hat craft, class recycling labels as well as lots of fun Earth friendly learning fun. 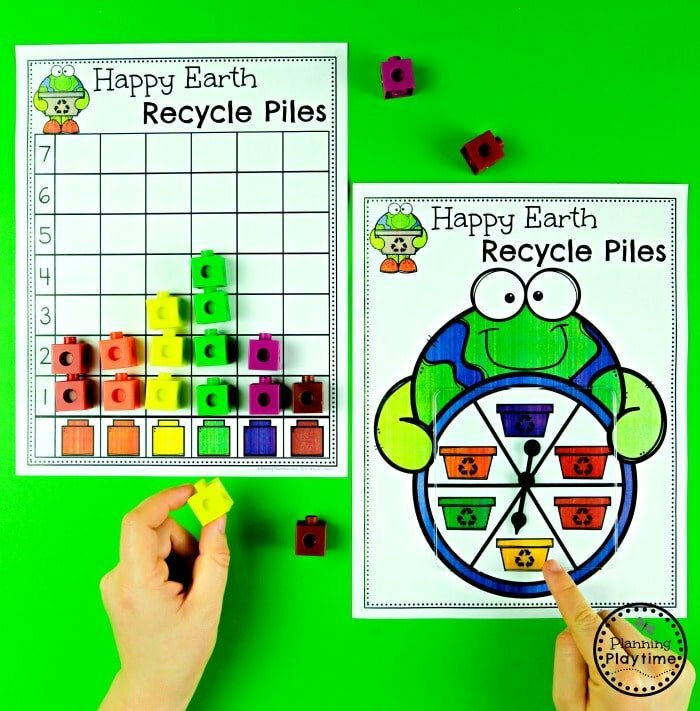 Looking for the manipulatives we used with our Earth Day Activities? We’ve collected all the links for you in one easy place, and we may even get a small commission when you buy through these links. It’s a great way to support our blog at no cost to you. Our Laminator and Laminating Sheets. 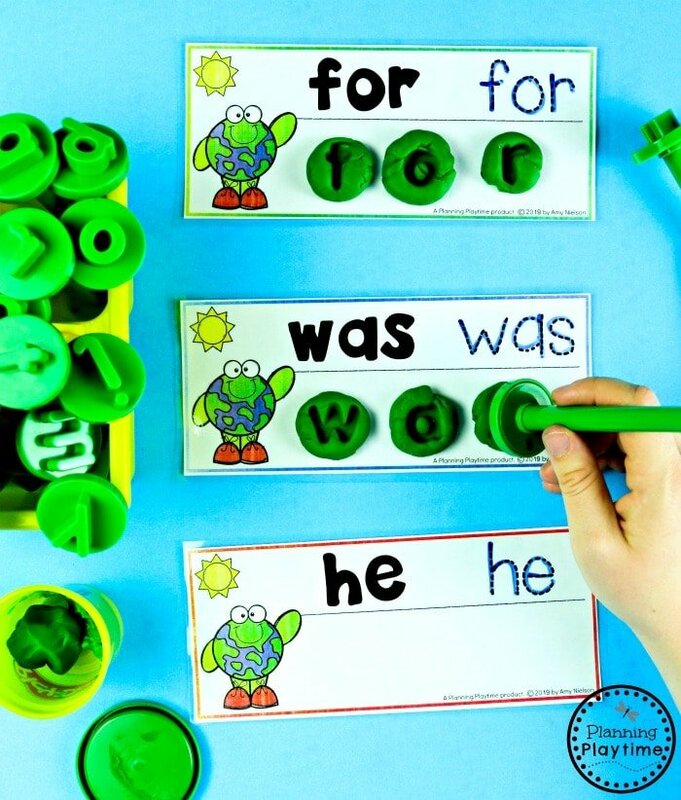 Sight words are a critical part of early fluency in reading. We are practicing our first 25 sight words here using our letter stamps and some playdough. 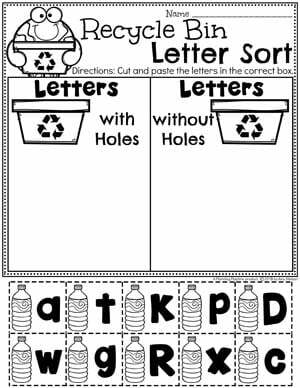 A recycle themed sensory bin could be a great way to use these letter cards. 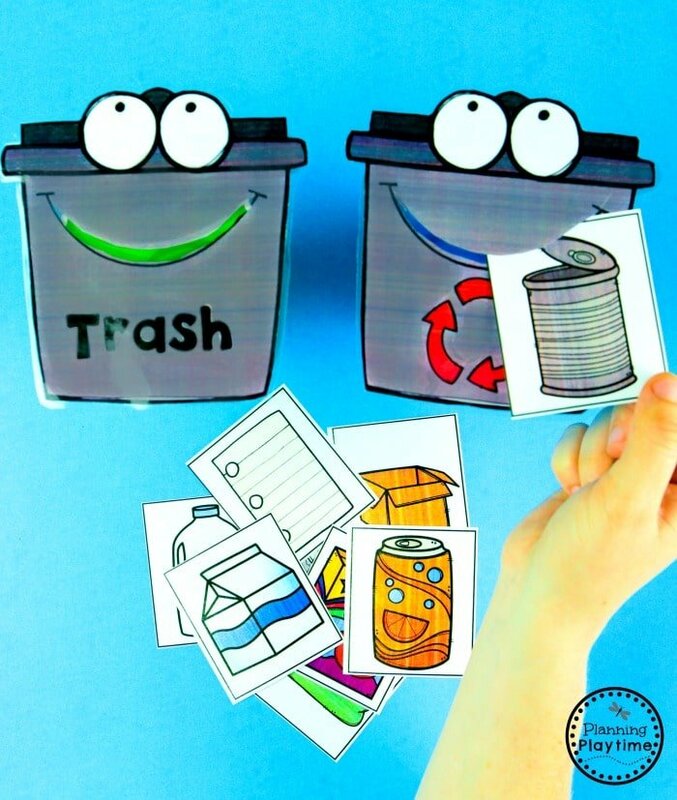 I would fill the bin with bottle lids and plastic letters. 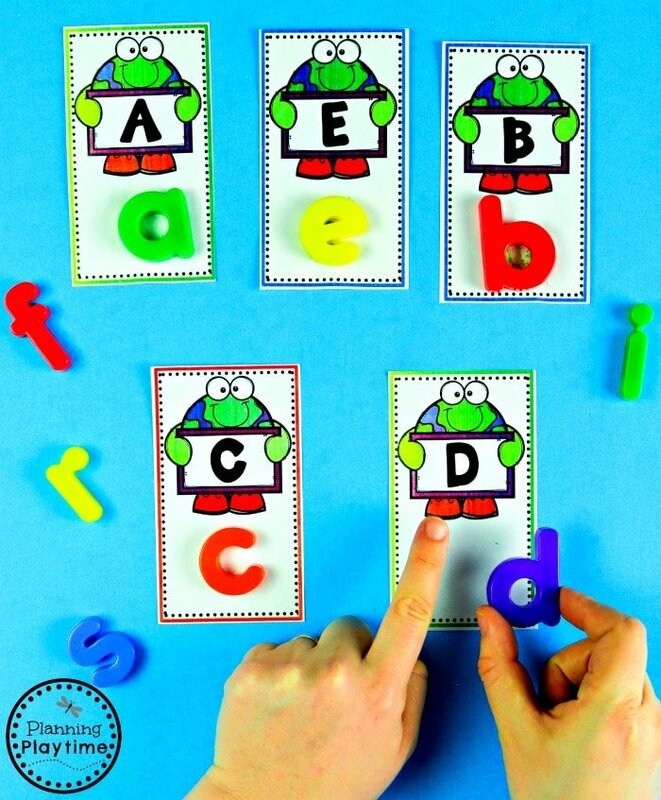 The kids can fish out the letters and place them on the matching cards. 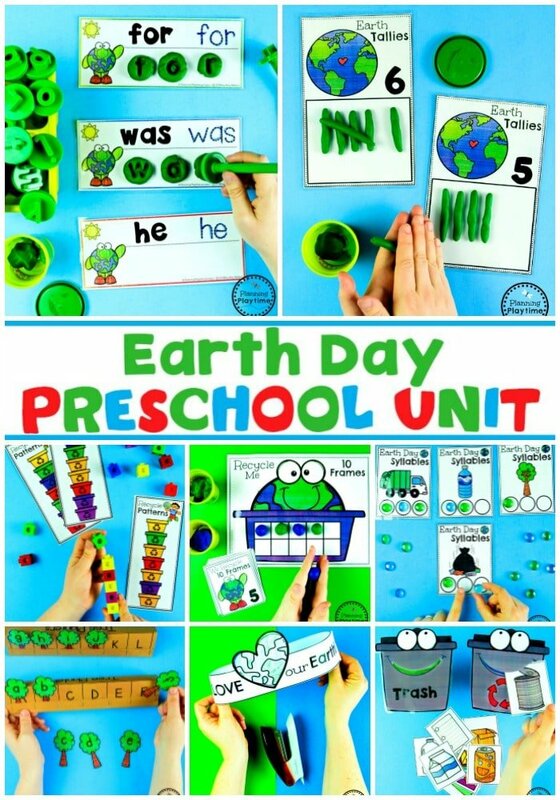 This Earth Day Hat craft is the CUTEST!! 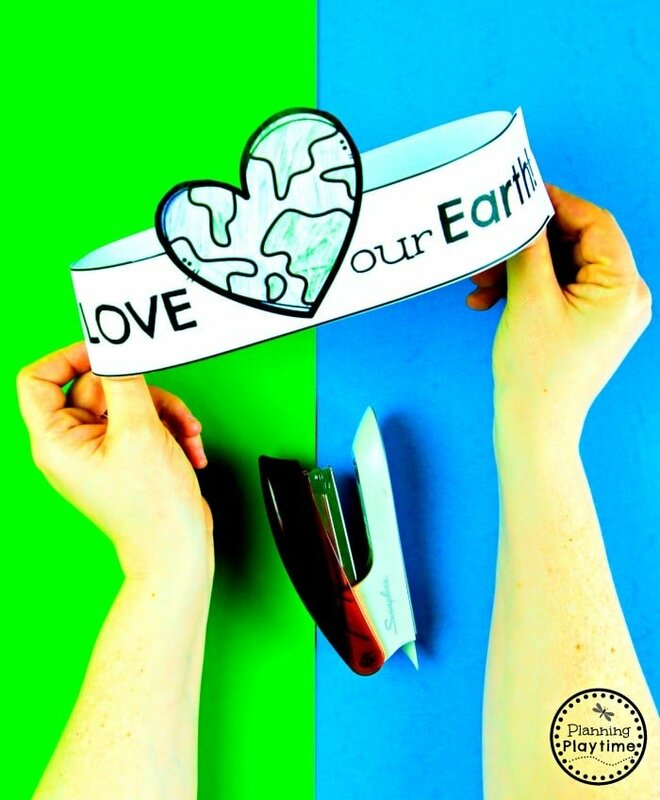 The kids will love coloring their little heart earth, and then they can proudly wear it home and teach their family what they’ve learned about caring for our planet. 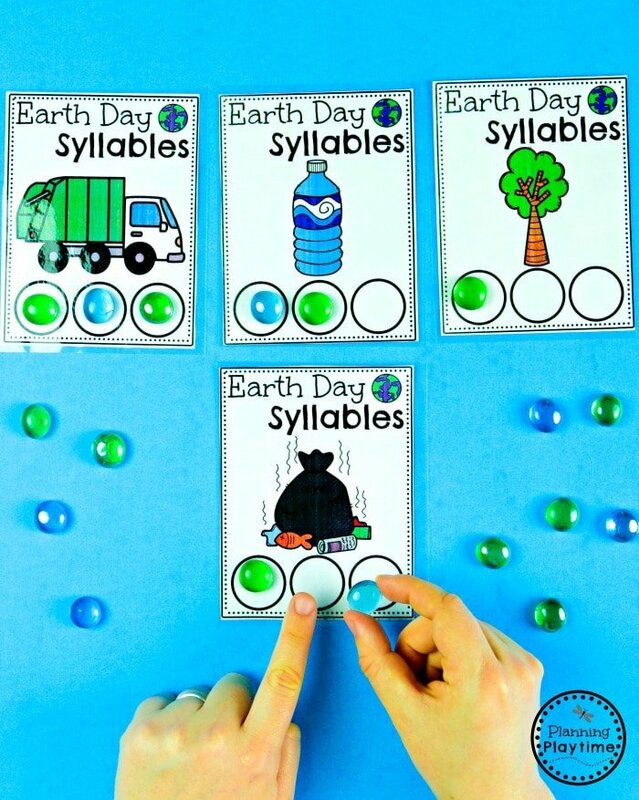 There are so many fun ways to use this Earth Day Syllables activity. We used marbles to mark the syllables, but bottle lids would be fun as well. Planting trees is such an important way to help our planet. 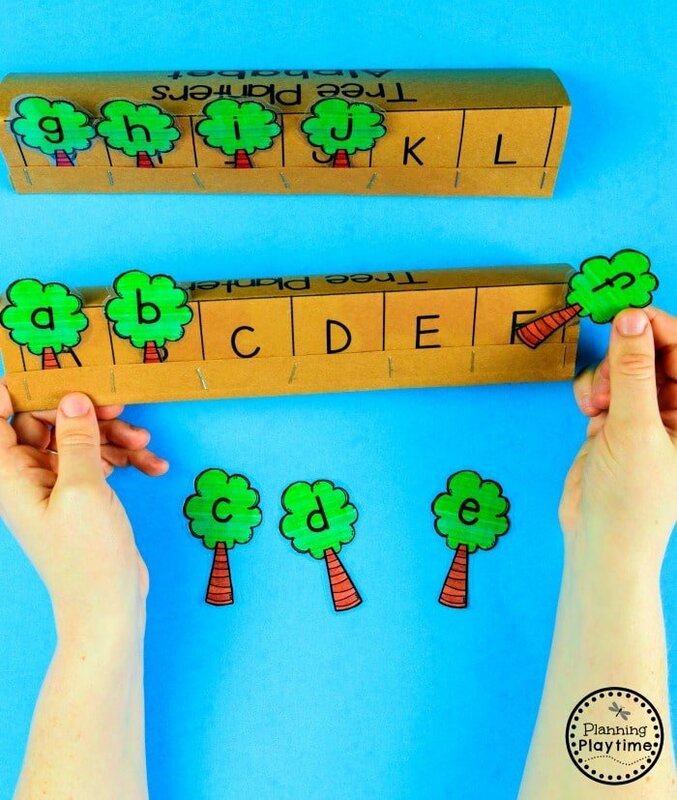 Plant some real ones if you can, but you can also practice letter matching with these. 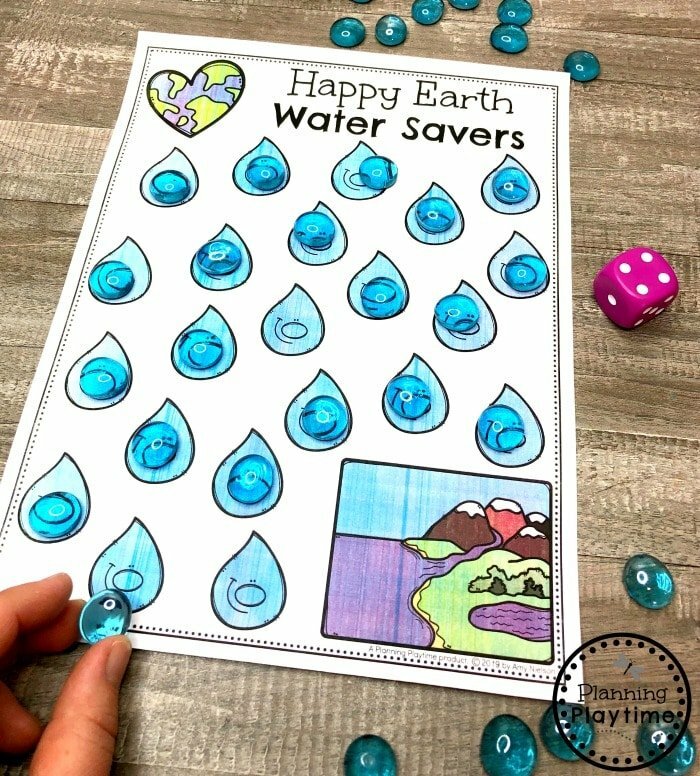 Another important Earth Day topic is water conservation. 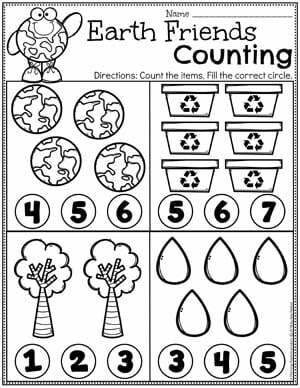 This activitiy is a fun way to practice counting while pretend play collecting and saving our water. 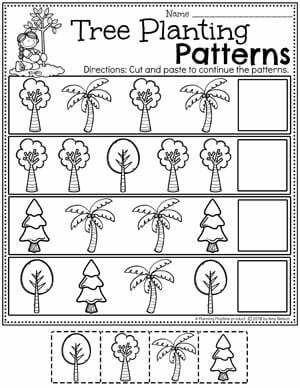 Graphing is another important early math and science skill. Here we use a spinner to randomly choose our colors to graph. 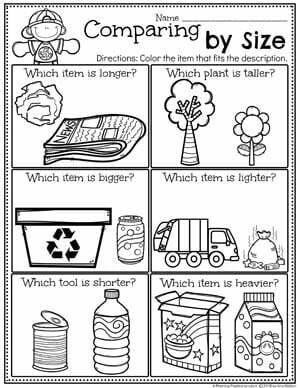 This interactive chart allows kids to show and talk about different ways they have learned to care for our planet. 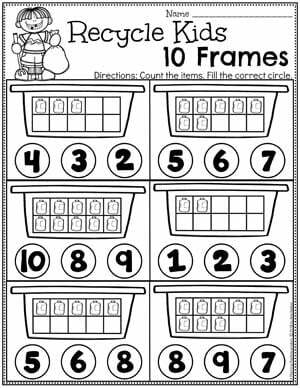 Making 10 is a kindergarten math standard, but we can start working on it in preschool. We used playdough balls, but bottle lids would be a fun option here as well. 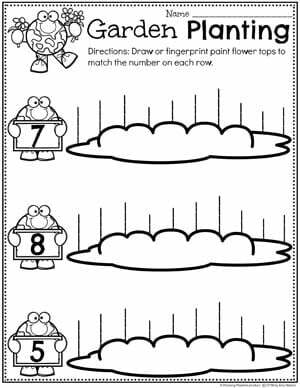 Tallies are a great way to count and represent numbers. 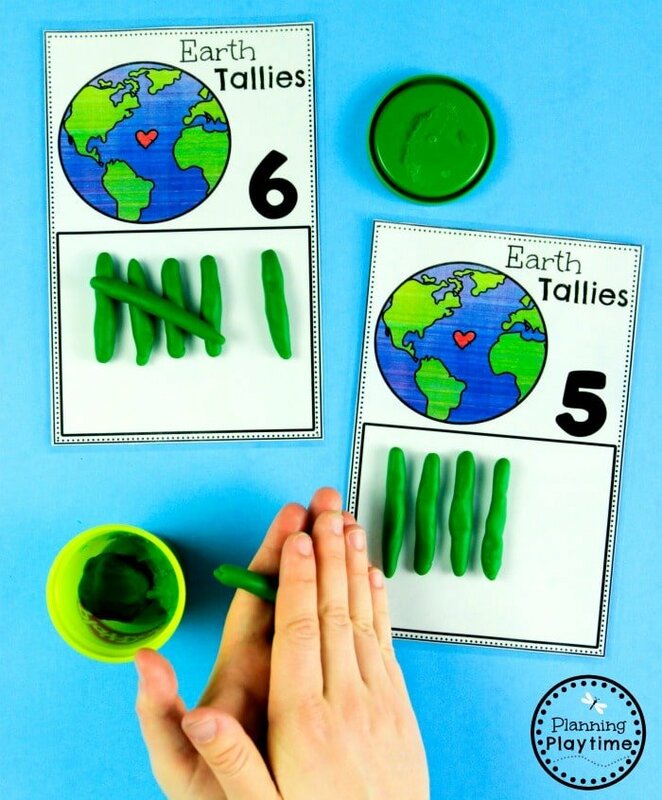 We LOVE this Fine Motor idea of creating the tallies with playdough, and of course we did them in earth theme colors. 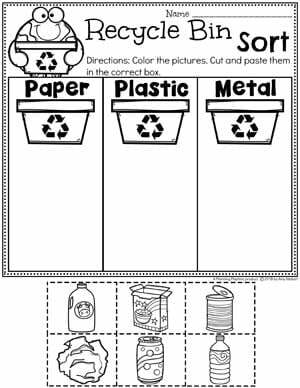 Recycle bins can come in lots of colors. 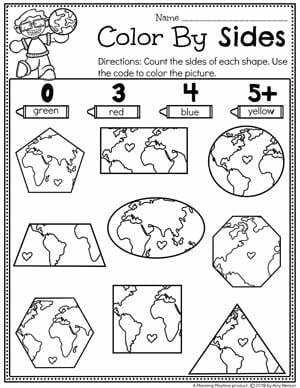 For this Earth Day activity we are creating color patterns to match the recycle bins. 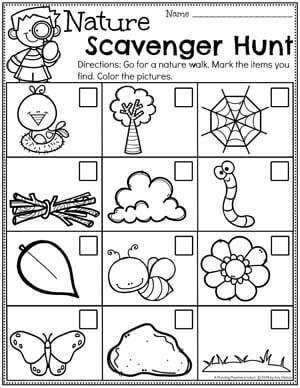 I love to bring nature into our learning. 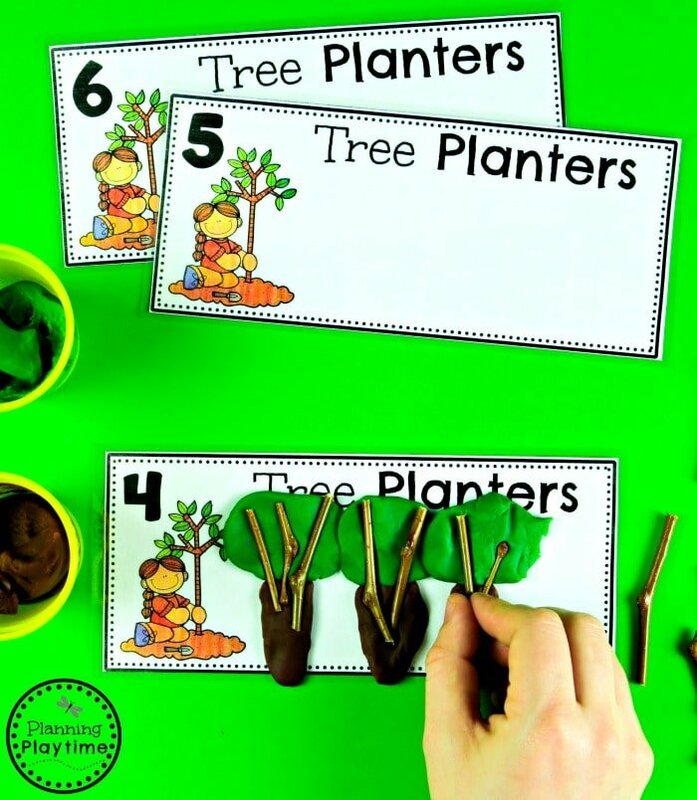 For this activity, I would collect twigs from outside to use as your counting trees. 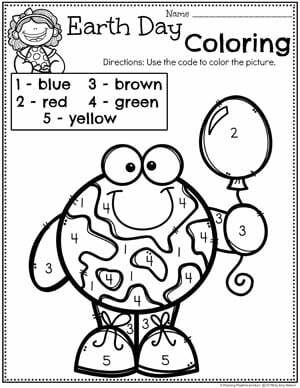 You can “plant” them in a pot of dirt or use brown playdough. 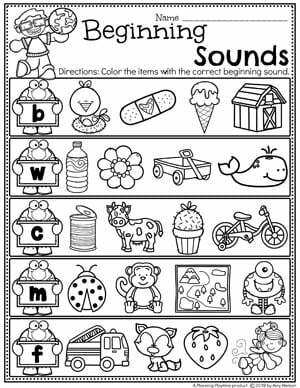 This activity helps children differentiate and catagorize various items to place them with like items. 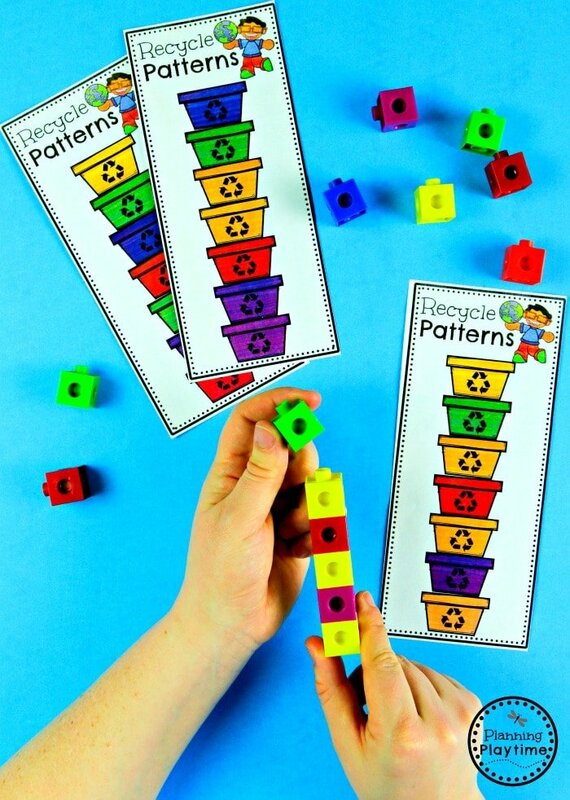 This is a math and literacy skill, and it helps children practice recycling. 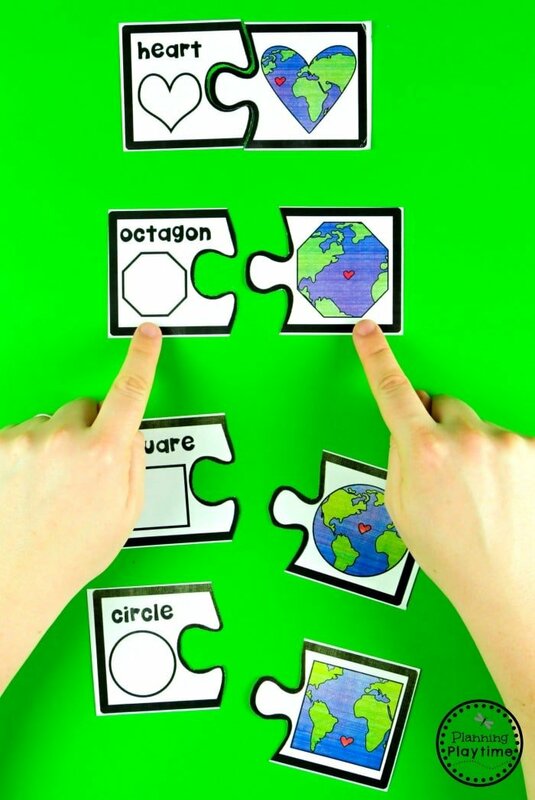 We love these puzzles for some fun shapes practice. You may have a chance to go out and actually pick up some trash. This game is an indoor, small table version of that. We scattered garbage (pom poms) on our earth. Then we rolled a dice and counted that many pieces of trash to pick up. 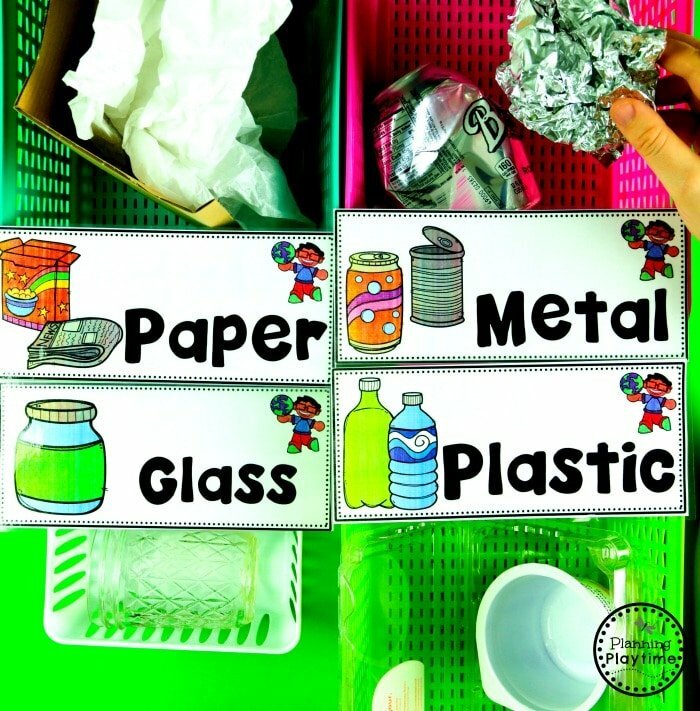 One of the best ways to practice recycling is to set up a recycle station in your classroom. We use these labels for this. 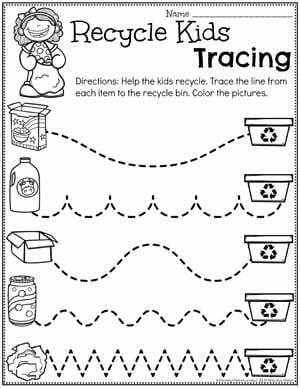 Kids can sort items they bring from home or in our box. 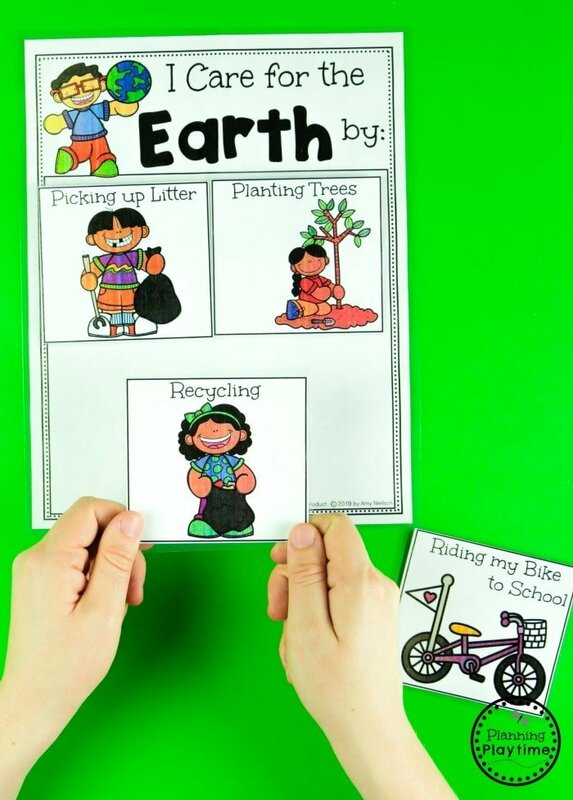 In addition to the hands-on Earth Day activities above, we also created 15 fun worksheets for you. 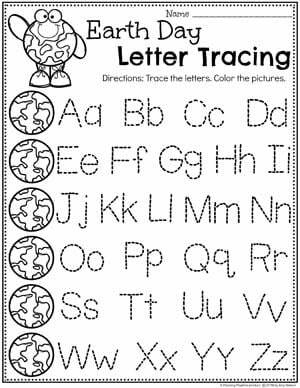 These worksheets include tracing, counting, letter recognition and more. 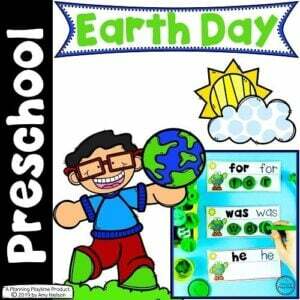 We hope you loved these preschool Earth Day activities as much as we do. You can find them to purchase below.